1. If there is only the default group in computer list, please add a new department at first. 2. Choose destination computer(s) in computer list. 2. 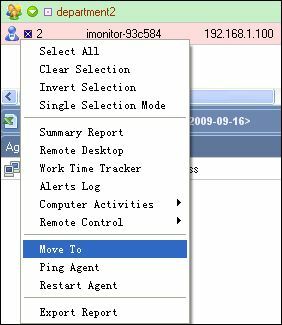 Move mouse onto the computer you want to move in computer list, and click mouse's right button, a popup menu will appear now. 3.Click "Move to" menu item. 4. Select a department to put the computer into it, and click 'OK' button.